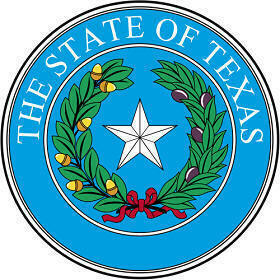 The Texas state seal identifies government buildings and officials and the lone star is the centerpiece for the state flag. The symbolism, history and emblems of the Texan seal are described in this article with fast facts and information. Fact 4: It was approved by the Secretary of State John Hannah, Jr. and Governor Ann W. Richards. The obverse (front) side of the seal is a star of five points, encircled by olive and oak branches. The Lone Star signifies Texas as a former independent republic and it also serves as a reminder of the state's struggle for independence from Mexico. The reverse side of the Great State Seal consists of a shield surrounded by the six national flags that have flown over Texas. The flags featured on the reverse of the Texas State seal are of the Kingdom of France, the Kingdom of Spain, the United Mexican States, the Republic of Texas, the Confederate States of America and the United States of America. The lower images on the shield picture the cannon of the Battle of Gonzales and an image of Vince's Bridge that featured in the Battle of Jacinto. The Mexican authorities had given the settlers of Gonzales a small cannon to help protect them from frequent Comanche raids. As political unrest increased with rebellions in different states the Mexicans demanded the return of the cannon. The Texans refused and the Battle of Gonzales was the first military engagement of the Texan Revolution. The Texas Revolution was the military conflict between the government of Mexico and Texas colonists that began October 2, 1835 and resulted in the establishment of the Republic of Texas after the final Battle of San Jacinto and Vince's Bridge on April 21, 1836. Vince's Bridge played a critical role during the April 1836 Battle of San Jacinto. Vince's Bridge was a wooden bridge constructed by Allen Vince over Sims Bayou near Harrisburg in Texas and its destruction by Texan soldiers prevented the arrival of re-enforcements to General Santa Anna's Mexican Army and resulted in the decisive defeat of the Mexican army, effectively ended the Texan Revolution. The phrase "Remember the Alamo" reflects the famous siege between massive Mexican forces against a small band of Texans (see below). The State Seal is kept and used as required by the Constitution and laws of the state. 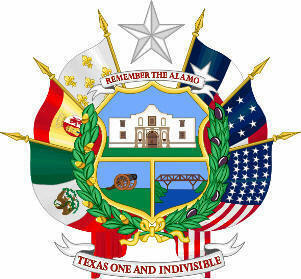 This is a flyer showing an early design of the State Seal which features an image of the Alamo. 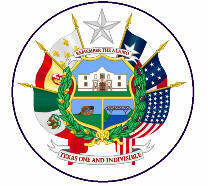 The phrase "Remember the Alamo" is so important to the history of the state that it is included on the reverse of the seal. The Alamo was a mission in San Antonio and the site of a bloody 13 day siege February 23 – March 6, 1836 by Mexican forces totalling 1800, under President General Santa Anna, against a handful of American rebels fighting for Texan independence from Mexico. The Texan force of about 180 was led by Colonel Jim Bowie and included Davy Crockett and William B. Travis. The Texans were nearly all killed but "Remember the Alamo!" became a rallying cry for Texans through the remainder of the war. For detailed facts refer to the Battle of the Alamo.